These fried potatoes and eggs are the best breakfast ever! So filling, complete with lots of nutrients and so easy to put together. All you need is potatoes, eggs, and a few basic ingredients. Also, check me out cooking in my new kitchen! You guys, these are the “French fries” I grew up eating. Unlike the regular French fries which are fried twice, these ones only go in the oil once. 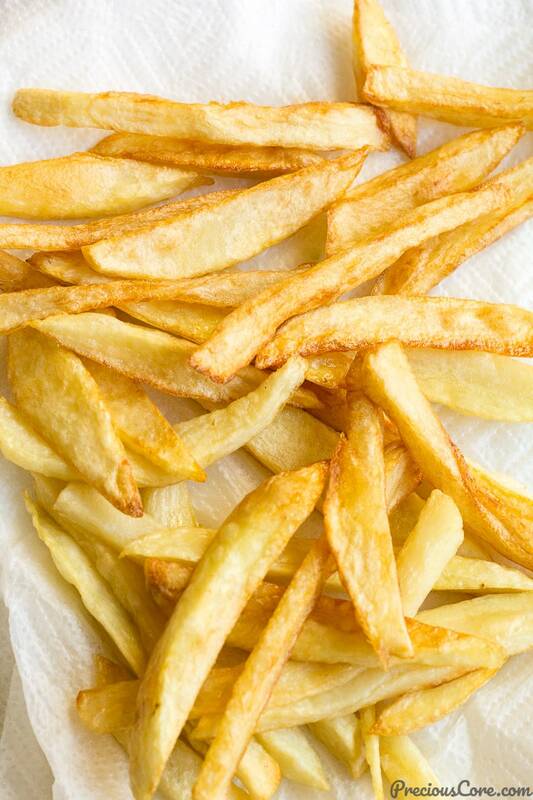 No need to soak the potatoes in water before frying – you just peel wash and fry right away! Easy peasy! Then, in my country, Cameroon, we alternately refer to omelettes/omelets as fried eggs! And the fried eggs could contain lots of ingredients or very few ingredients. 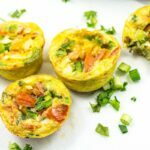 It could be just plain eggs with salt and/or seasoning cubes or, it could be eggs, loaded with veggies and herbs. 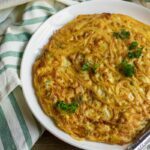 My favorite things to include in my omelette are tomatoes, onions and parsley. Sometimes, I will include a little chopped habanero pepper for some heat. Basically, I use the ingredients I have on hand to make my omelette. 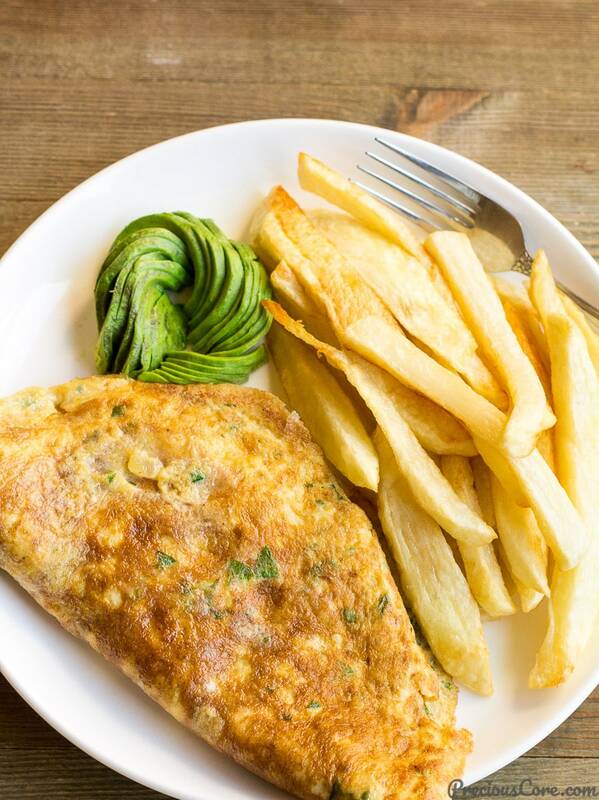 The combination of freshly made fries and omelet for breakfast is to die for! 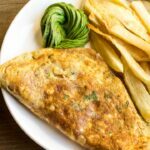 The fries are crispy on the inside, tender on the inside, the omelet is loaded with crunchy veggies which makes it fresh and it is super tasty! Fried potatoes and eggs for president! To make things even better, I serve this with some avocado on the side. If you are curious to know how I shape my avocado, check out the video for directions. 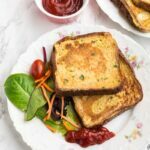 This is the one African breakfast recipe you want to keep and make over and over again! 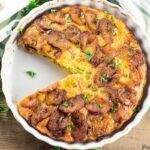 It is such a treat for breakfast or brunch! 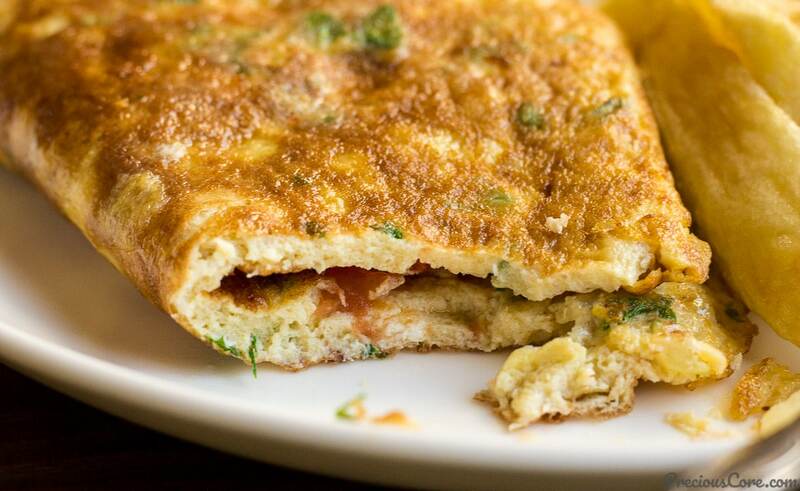 I’ll leave you with another pic of that omelette… epic! Full Fried Potatoes and Eggs Breakfast Recipe below! 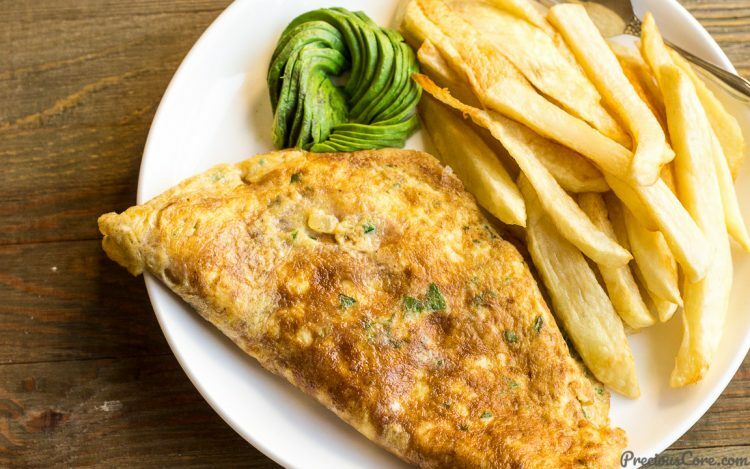 Fried potatoes and eggs breakfast recipe consists of African style french fries and omelette. It is so filling that you could equally make it for dinner. It is one of my favorite breakfasts ever! Watch the video to see how I make this! Feeds two hungry people or could stretch to four smaller servings. Peel and wash potatoes then pat dry and cut into french fry shapes. Sprinkle about 1/4 teaspoon of salt over the potatoes then toss to ensure the salt gets all over the potatoes. Let the potatoes cook for about 8 minutes then you flip them and let them cook for about 2 more minutes or until crispy on the outside then you remove them and place on paper towel to absorb the excess oil. Place oil in a skillet and set on medium heat to heat up for 2 minutes. Meanwhile place the eggs, onion, tomato, parsley, white pepper, maggi (or salt) in a bowl and beat with a fork. Pour the egg mixture into the skillet and tilt to make sure the mixture completely coats the bottom of the skillet. Change the heat to low and let it cook for about 5 minutes on one side until the omelette is set on that side. Flip to the other side and let it cook for about two minutes until it sets on the other side. Serve warm with the fried potatoes and some avocado on the side if you like! 1. If you are uncomfortable with using the seasoning cube in your egg, simply substitute with salt to taste. 2. 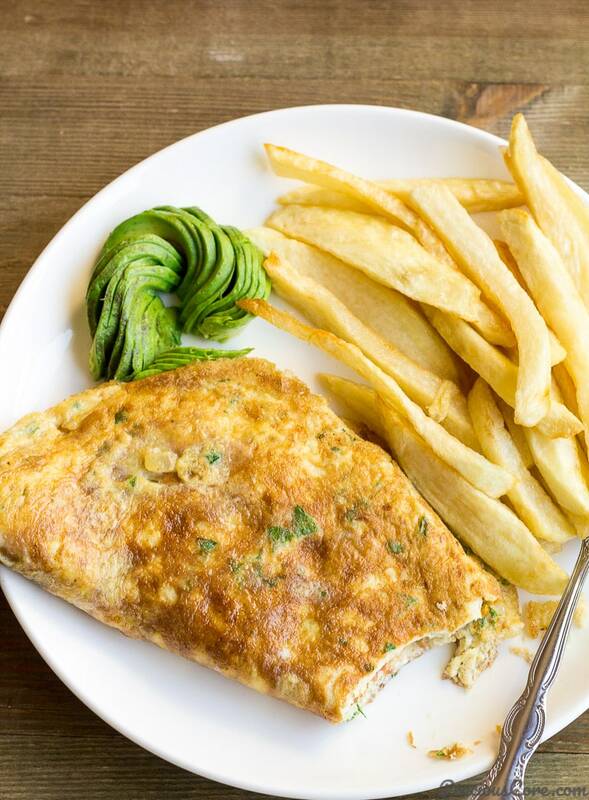 You could customize the omelette by adding other vegetables according to your taste. Sometimes I add some bell peppers or some chopped celery. Also, if you love heat, feel free to add in a little chopped habanero pepper or chili pepper. 3. I find that four eggs make a really neat omelette! So feel free to cut the omelette into two or four and serve or you could make 2 separate omelettes with 2 eggs per omelette. What a beautiful kitchen.Be blesssed always and your family. Breakfast on point.Congrats for baby To be. Awww thank you so much, Sue! thanks my lovely friend. 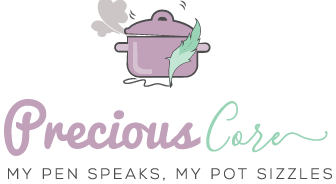 I am one of those who asked for this recipe. 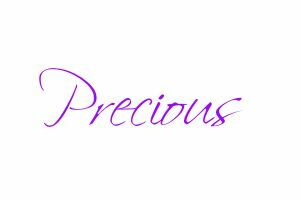 May the Lord bless the freuit in your womb. Thanks so much, my dear. So glad I could fulfill your request! I love love love your kitchen. Seeing you cook in it is sheer pleasure.I am believing God for a lovely kitchen too in my own house too very soon. I can understand the feeling of ecstasy of cooking in a kitchen like this. You deserve it and much more. Awww thank you so much, Ola! I pray you get the kitchen you dream of.